I was having a bad day. Or rather, my mood was rather foul. It was my lunch break, and I was walking through Grand Avenue mall in quest of a culinary delight. I chanced upon a sight that made me uncomfortable at first, because I didn’t know where to put my eyes. A kissing couple. As I got closer, I kept watching them, and how they were trying to walk together while kissing. The woman was walking backwards, and the whole sight somehow really cheered me up. By the time I passed them, I was beaming a glorious smile. After I got my lunch, I was walking back to work and noticed two seagull turds just miss me by a foot or two. How fortuitous. I felt so lucky. 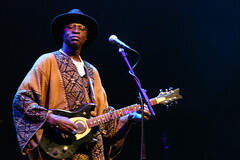 Malian blues musician Ali Farka Touré succumbed to bone cancer on March 7th. He was 67.